This is a reader submitted guest post from Shannon of Island Shire Farm. Today we created a wine press. I used some ideas from a couple of guys on the Internet, with a few of my own modifications. 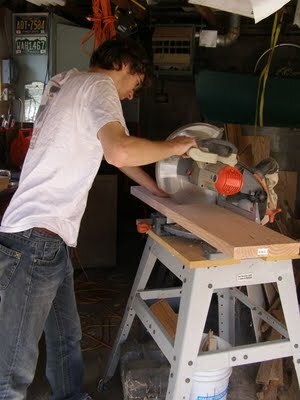 First cut the 2×10 board into two 31″ pieces and two 18″ pieces. We cut the remainder into two rough hexagons that fit into the bottom of the Home Depot pail as platens, or squishing devices. 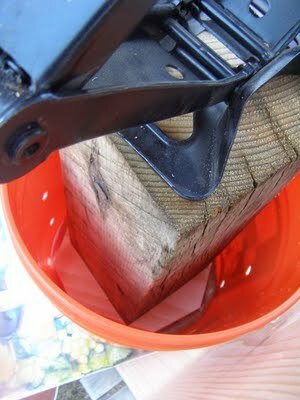 The greatest modification we did was in terms of what we did to the pail. Rather than the very large 1″ holes that Kimball Herrick used in his plastic buckets, or the spigot only that Kevin Kossowan used in his pail, we drilled a series of 1\2″ holes as close to the bottom as possible for the wine to pour out, and then a few more about 2″ and 6″ from the bottom, just for a little air flow. The press itself is basically just a box with the four corners supported with little triangles for extra strength. At first we made the bottom triangles too big, and had to reduce the size so that the bucket could protrude a little toward the back. The power is supplied by a car jack which we ingeniously hung from the top with a single bolt. My jack’s base didn’t have any holes for bolts, so I inverted Kevin Kossowan’s design, and I think it’s better for it, since the base has a much larger area of pressing on the platen. In the photos, the press is sitting on top of a wooden chair to get it up off the ground. Here my helper loads the grape must, skins and all, from a 20 gallon food grade pail into the netting fabric, which is held in a stainless steel bucket. After this he pulls all four corners together and ties it all up into a nice little wet package with string. A lot of juice drains out this way, but the press gets the rest of it out quite nicely. Here is a closeup shot of the platen being pushed down into the pail with our monster plunger. The car jack puts a good amount of force on the platen. The puck of skins and seeds comes out pretty dry. Each one of these packages is called a “cheese.” We noticed that the cheese tended to spread out quite a bit in the first pressing, and since our platens don’t go all the way to the very edges, some of the cheese pooches out from under the platen inside the pail. So we took the much drier cheese out, jiggered the edges into the middle, and then twisted the whole package tighter and put it back into the press. We usually got more juice out that way. For a while we pressed with just one package of must tied into cheesecloth. However, cheesecloth threads tend to move around, and on the third batch ours tore, so I had to go off to get some netting type fabric from Joann’s. Then we had enough fabric to do two at a time, so everything went a lot faster after that. The tray is one that I bought from a thrift store, and fittingly has wine bottles on it. We drilled a hole along one edge and the liquid just drops down into a vessel. We will still be able to use the tray, and if anyone wonders what it is, we will say that it’s a WINE tray, can’t you see that? 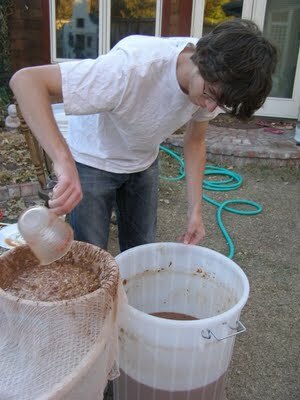 From about 13 to 15 gallons of must, we have ended up with 10 gallons of liquid. Some of this will be lost in the various rackings we will do over time, to get rid of sediment. 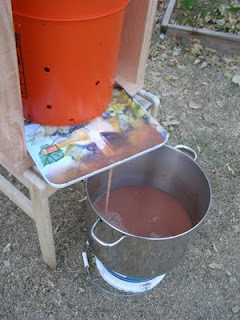 If we ever get a big haul of apples, apparently I could also used this as a cider press, but that is for another day. Editor’s Note: This design is a simplified version of the “Whizbang Cider Press” which is designed to be built yourself with some manufactured speciality parts. A photo essay is on the whizbang website, and detailed instructions are published in book form. It sounds like you want platens that fit more snugly. 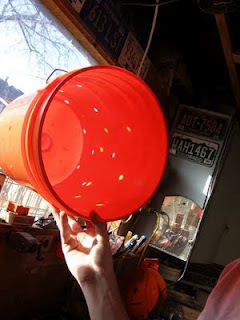 Maybe you could use the bottoms of five-gallon buckets? I just found this site from one of your youtube videos and have probably spent a good hour reading some of your posts! What a great theme for a website. 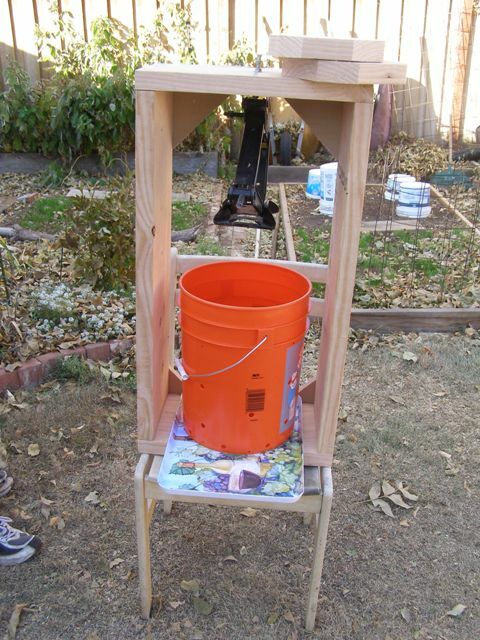 I clicked with some hesitation onto this wine/cider press article as I knew it would make me wish I’d built my own! I’ve not long purchased a ready-built press (from http://www.simplyciderpresses.com) but there was always a part of me that fancied the challenge of making one from scratch. And now you’ve made it look so easy! Oh well, I am happy with my press so I’ll just have to tackle one of your other projects. I think the portable BBQ bucket is fantastic so I might give that a shot.